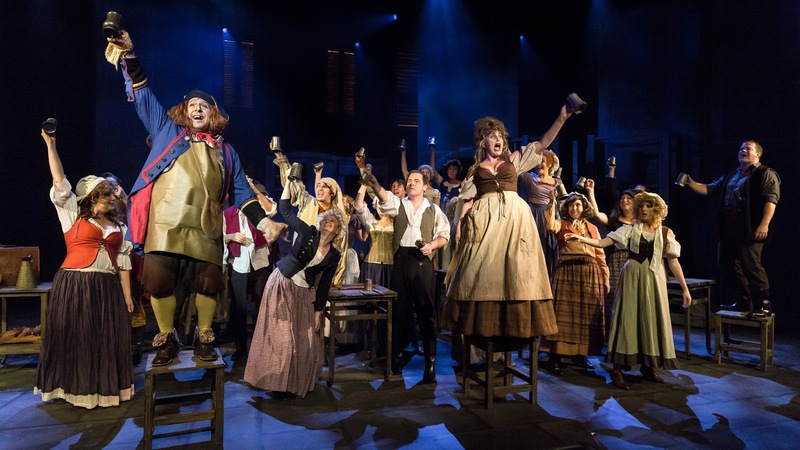 Twenty-four years after presenting the hugely successful Victorian non-professional premiere of Les Misérables, CLOC Musical Theatre and director Chris Bradtke reunite to spend One Day More on the barricade. Staged on a grand scale and blessed with an army of powerhouse singers, the production is well suited to reaching the far corners of the National Theatre’s sizable auditorium. 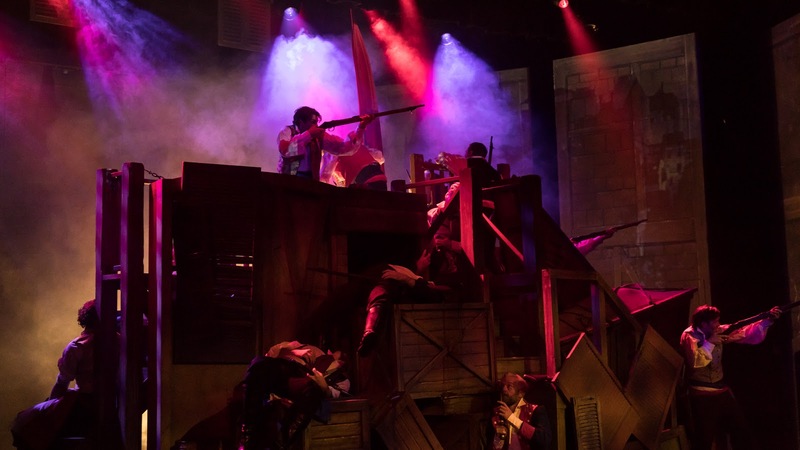 CLOC matches professional standards in many ways, but their added bonus is always cast size; this Les Misérables is no exception to that luxury, with around 50% more cast members than a professional company could afford. Marketing for the season promises “a new production,” and while this has generally been achieved, particularly in of terms of sets, the overall tone is highly traditional. 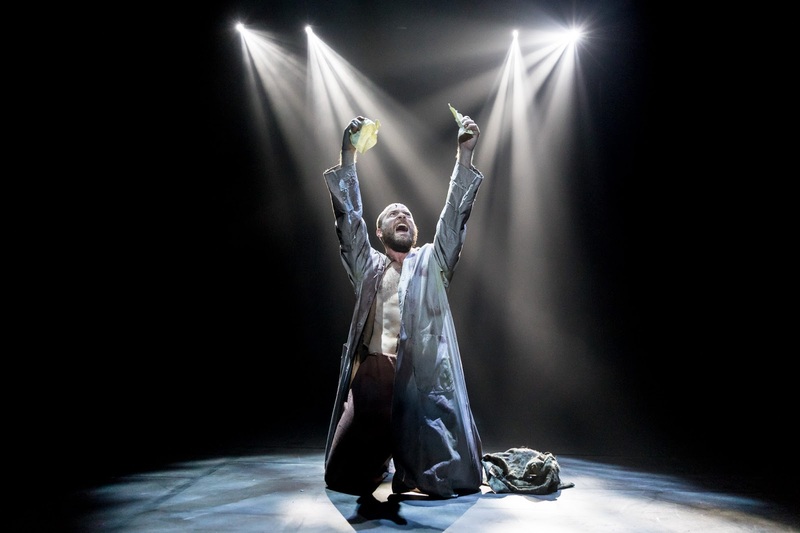 CLOC had a stunning success last year with a radically rethought Jesus Christ Superstar, an ingenious production that was gripping, affecting, surprising and thought provoking (not to mention, ultimately, award winning). In his third time at the helm of Les Misérables, Bradtke knows the show intimately. There is no doubt his storytelling is clear and that loyalists will thrill to the chance to enjoy the show again. It must be noted, however, that there seems to be a missed opportunity to illuminate the very well known work through a new lens. Bringing to mind their acclaimed work on 1999’s The Secret Garden (Whitehorse Musial Theatre) Bradtke and set designer Brenton Staples use an array of tall set units that can be moved and rotated for different settings. Giving the production a unique look, the sets often create a striking image and easily create the large number of locations needed for the story. The barricade is on an impressive scale, but looks a little too safe. The fact that it rotates is also impressive (even surprising), but comes at a cost of it not filling the width of the stage, making several students look very vulnerable in the gunfight battles. The lighting design, by Brad Alcock, includes striking moments, particularly in the genuinely thrilling gunfight battles. An overuse of white light, however, often exposes the stage as too crowded and robs some scenes of their mystery. The set for the barricade, in particular is too clearly exposed as a collection of hand painted items. A very successful aspect of the lighting is the superb clarity of the large-scale projected period backdrops, which are in sharp focus on a dozen or more panels at once. Marcello Lo Ricco’s sound design is crisp and detailed, particularly in the individual amplification of orchestral instruments. Every aspect of Andy McCalman’s excellent work as musical director can be distinctly heard, even if the volume feels just a little high at times. At times, it is difficult to be sure which character is singing, but the well-known story moves along regardless. The transmission of gunshots from speakers around the auditorium elevates the sound to cinematic standard. Costume designer Victoria Horne extends her remarkable range of skills by working against type on such a gritty show. Amidst the dark hues there are the odd splashes of colours, with highlights including Valjean’s moss green jacket, Bamatobois’ turquoise jacket and a splendid set of military uniforms. 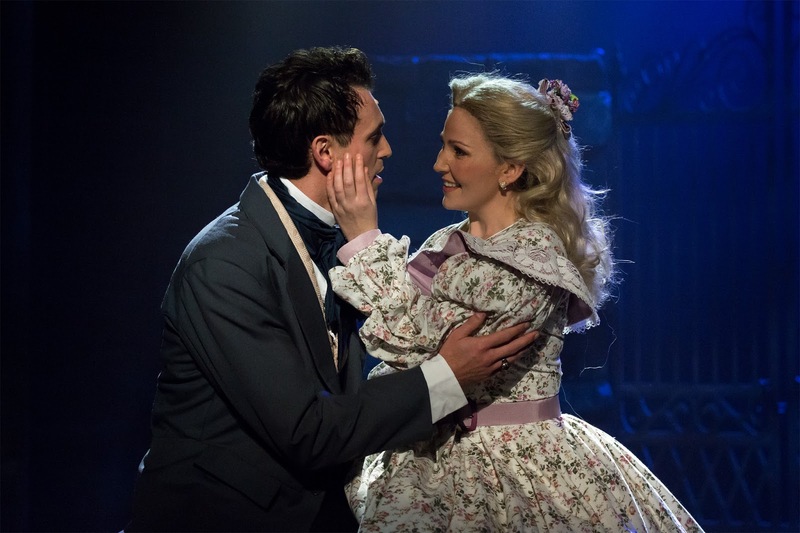 A rare misstep is Cosette’s flouncy floral frock, which makes the usually demure character look rather frumpy. It is also not clear why Fantine does not wear the apron and bonnet uniform at the factory. The individually detailed, jewel-coloured ball gowns for Marius and Cosette’s wedding may be the most beautiful ever seen in any production of Les Misérables the world over. 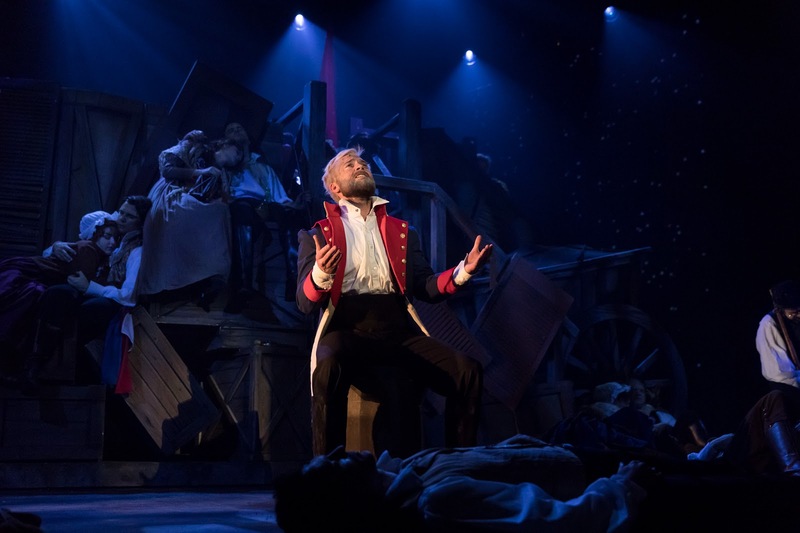 With a physique that clearly indicates Valjean’s extraordinary strength, Mark Doran is perfectly cast as the noble hero Jean Valjean. Doran sings the role, high notes and all, with deceptive ease and with a pleasing variety of tone as befits each scene. Shaun Kingma successfully maintains an air of dark mystery about Javert. Kingma’s rich, characterful baritone voice is used to marvelous effect; act one aria “Stars” really brings down the house. Daniel Mottau gives a thrilling performance, raising the role Marius from the usual pouting poseur to a true leading man. Mottau’s singing is superb, making “Empty Chairs At Empty Tables” a real highlight. A magnetic presence, Mottau cultivates chemistry with all of his scene partners and engages audience interest in whatever drives Marius at each stage of the story. A host of newcomers shine in their first CLOC show. Matthew Green has the soaring voice for Enjolras. Kirra Young brings out the full tragedy of fragile Fantine. Emily Morris is a pure and angelic Cosette. Eighteen-year-old India Morris is a clear crowd favorite as Éponine, belting out her vocals with unwavering precision and power. In charming form, Scott Hili slyly offsets the callous machinations of slimy Thénardier with a merry twinkle in his eye. Still firmly in the realm of playing ingénue roles, Melanie Ott surprises with a highly characterful performance as Madam Thénardier, her brilliant comic timing provide welcome laughs. The chorus is blessed with any number of performers who have played leading roles elsewhere, and the choral singing is subsequently of an extraordinarily high standard. Standouts include, but are certainly not limited to Ric Birkett (who is seen in the featured role of Bishop of Digne, Ian Andrew (Bamatobois), Lauren McCormack (vicious Factory Girl) and newcomer Owen Clarke (Feuilly). 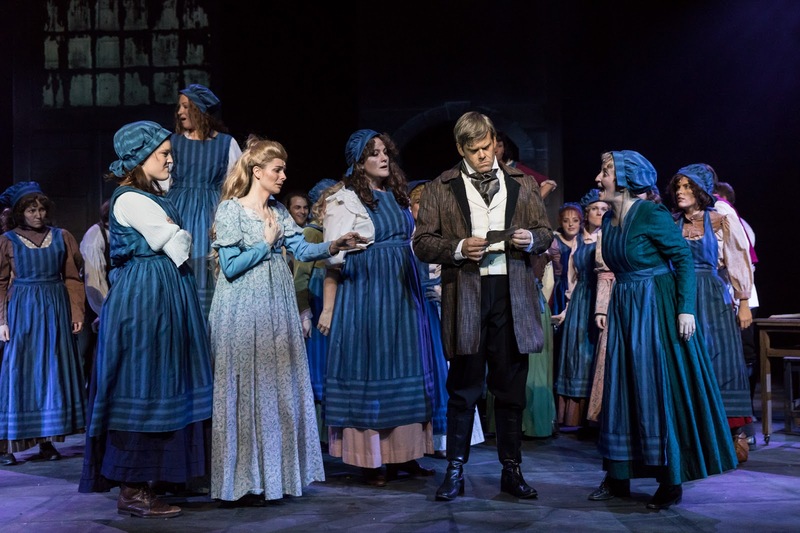 Lovers of Les Misérables, of which there are an ever-growing abundance, will surely enjoy the chance to see the beloved show again, especially in a production of such quality. The question of what might have been, with a more adventurous take on the classic, will just have to remain unanswered at this time. CLOC Musical Theatre presents Les Misérables at National Theatre, Melbourne until 27 May 2017. What is wrong Simon..You have been in a bad mood since Cabaret !! Nothing wrong and no bad mood, just calling it like I see it! I think I get where Simon is coming from here. CLOC really challenged themselves last year with Jesus Christ Superstar and came up with something completely fresh and new. 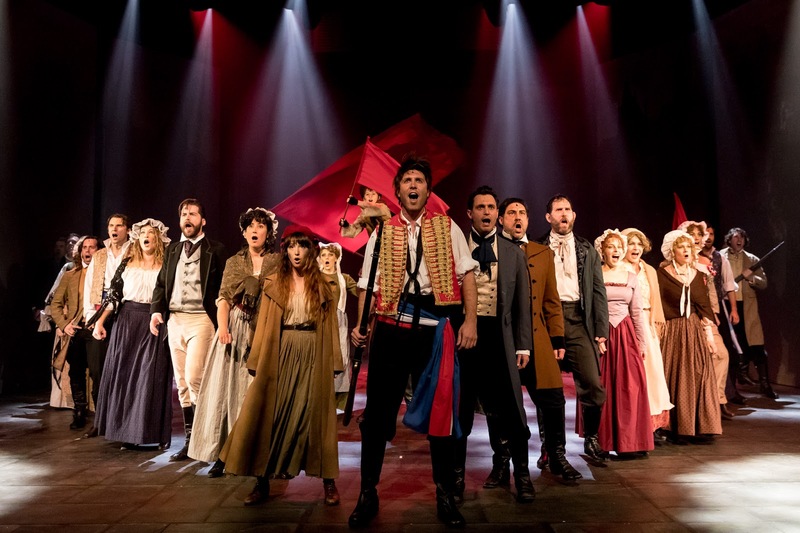 I get the impression that perhaps their Les Mis took a more well – known and conservative path, and that amounts to a missed opportunity (in Simon’s estimation) from a team that likes to stand out for taking popular material and making it their own. It reminds me of a terrific version of Company (put on by Watch This) several years ago. What I loved about it is that while the basic template remained intact, the major difference was in the portrayal of Bobby. He seemed smaller, more unsure and vulnerable. Not cocky or confident like Neil Patrick Harris or Raul Esparza in the filmed versions I have also seen. In fact, the entire show seemed to be taking place inside his head, almost like an extended manic episode. The ending reinforced this point. I thought it was outstanding, but this approach really upset another well – known Melbourne reviewer, who preferred the way Company was usually performed. Is one way right over another? Can personal choice determine a review? Perhaps, that is why I have seen my favourite show, Merrily We Roll Along, done by four companies each a different way. All were great, and interpreted the story with very different staging, casting, and timing. I am looking forward to seeing how Watch This takes on the show later this year. Anyway, I’ll get back in my box now. I love your reviews for your honesty, and supportive as well as considered, constructive criticism. Thanks for your support Nick. Directors of well known operas frequently craft their own interpretation, mostly to great effect. For example, Opera Australia’s Cav & Pag last week was boosted with extra layers of fresh interpretation, making it all the more fascinating to watch. It will be interesting to see whether CLOC takes another brave/bold step (as they did with JC Superstar) again in the near future..